The tachi is not a katana and therefore should not be used in the same way. Sensei explained that we have to understand the evolution of warfare in feudal Japan in order to be able to adapt our techniques to the moderne world. He was mainly referring to the goshin. At first there was 1) the chinese ken, then 2) the tachi, then 3) the the ju (rifle), then 4) the katana, then 5) the cannon. These are the five spirits of warfare. When you look at this list of periods, you are surprised that you can actually put dates on them. The chinese ken preceded the muromachi period. The muromachi was mainly tachi. Then with sengoku jidai the rules changed by the extensive use (Nobunaga and his followers) of the rifle (teppo – musket type) that led to the Tokugawa/Edo period. It is only when peace time was established and heavily controlled that the katana began to widely used by the samurai. The muromachi and azuchi-momoyama periods were times of nearly permanent wartime. Samurai would wear the yoroi everyday and a heavier weapon like the tachi was of good use. 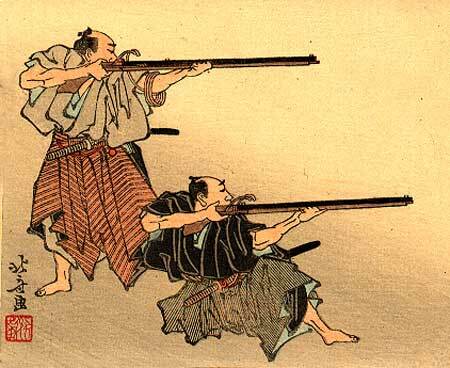 The sengoku jidai introduced the rifle and the yoroi was no more the safest outfit. One day in his home, sensei showed the helmet of a shogun‘s personal guard. Even though this antique helmet was in a very bad shape, sensei pointed out to me a big inward bump the size of a musket ball (approx. the size of a kid’s marble). The helmet was not pierced through but we can imagine that his former owner did have huge headaches afterwards. So the introduction of teppo into the wargame created a major change in battlefield experience. It must have been painful to the samurai to discover that their techniques were not good anymore after the introduction of rifles. Eventually this is how the Nobunaga, Hideyoshi and Tokugawa managed to get the unification done. When the Tokugawa period began, there were no big battle anymore and the yoroi was abandoned. No battlefield, means no need for yoroi anymore. The regular gi (reminder kimono is only for women) was no more protected. This was the beginning of the katana period when cutting abilities were developed (battôdô). This led to Meiji (1868) and the use of heavy cannons, the fifth big change. From all that it is easy to understand that the tachi and the katana being used in two different periods, their practical use should also be very different. 1. the tachi is a shield and the yoroi is the weapon, use the tachi more like a stick than a sword. This is also why you can flip the blade from one hand to the other the same way you use a hanbô. 2. the tachi being held cutting edge down, hontai nuki gata is the only logical way to draw it. 3. the tate nuki gata, doesn’t mean vertical as in modern japanese but shielding as in the ancient understanding of the term. 4. the koshiate *(holster hanging down from the belt onto the thigh) made it possible for the samurai to have more freedom in his movements. 5. as the tachi is used katate, the other hand would carry the yari. In this case, the yari becomes the shield and the tachi is the weapon. So please during your tachi trainings do not use the tachi as if it were only a big katana. With the year of tachi kumiuchi you are learning a totally new way of fighting. *to see drawings of various koshiate, please refer to “Samurai Sword Fighting” by Hatsumi sensei. Page 19 in the English edition.